B&W launches Diamond in-car sound system for BMW 7 Series | What Hi-Fi? B&W claims its Diamond Surround Sound System for the new BMW 7 Series "redefines what is possible for sound quality within a car". The 2015 Frankfurt Motor Show is in full swing, and although the cars are the real stars, there's no shortage of new in-car audio systems. One of the first big announcememnts comes courtesy of Bowers & Wilkins. Following hot on the heels of the launch of its new 800 Series Diamond range of loudspeakers, the British manufacturer has announced its first ever in-car system to feature Diamond Dome Nautilus tweeters. The set-up has been designed exclusively as a premium option for the new BMW 7 Series with every one of the 16 speakers specifically positioned for optimum sound quality. 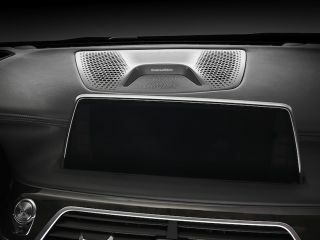 Three Diamond tweeters can be found in the front of the car working with the left, right and centre channels but the system also uses acoustic tech to match the car's interior. For example, the stainless steel speaker grilles feature acoustically optimised, patterned holes that allow more sound to pass through. The system includes seven of B&W's trademark Kevlar midrange drivers and a 10-channel 1400W amplifier. During playback you also have a choice of five different sound presets: Studio, Concert, On stage, Cinema and Lounge. The New BMW 7 Series will be available from October 2015 with the B&W system pricing starting at £3775.